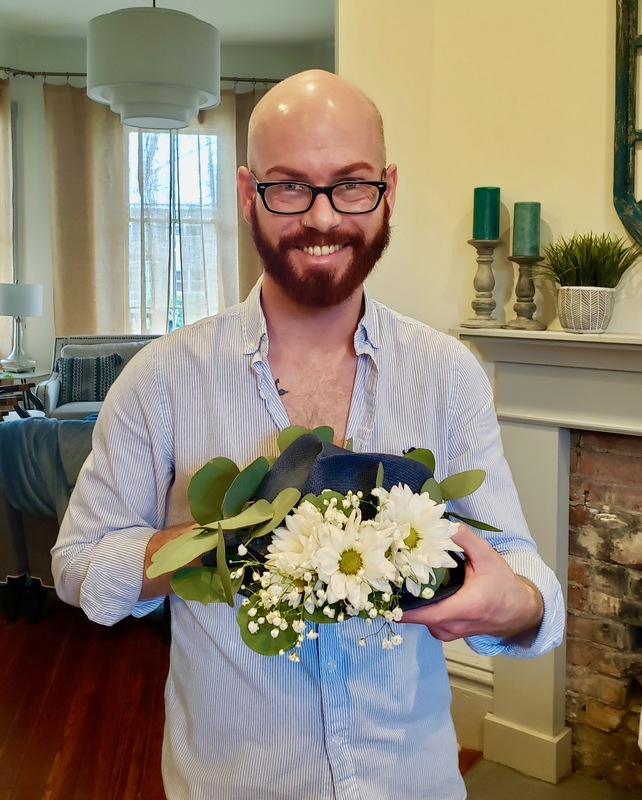 This is Alex here: I am one of our two flower party hosts in the Savannah area. So hopefully I will get the chance to work with you in the future as we have more flower parties for celebrations here in Savannah. 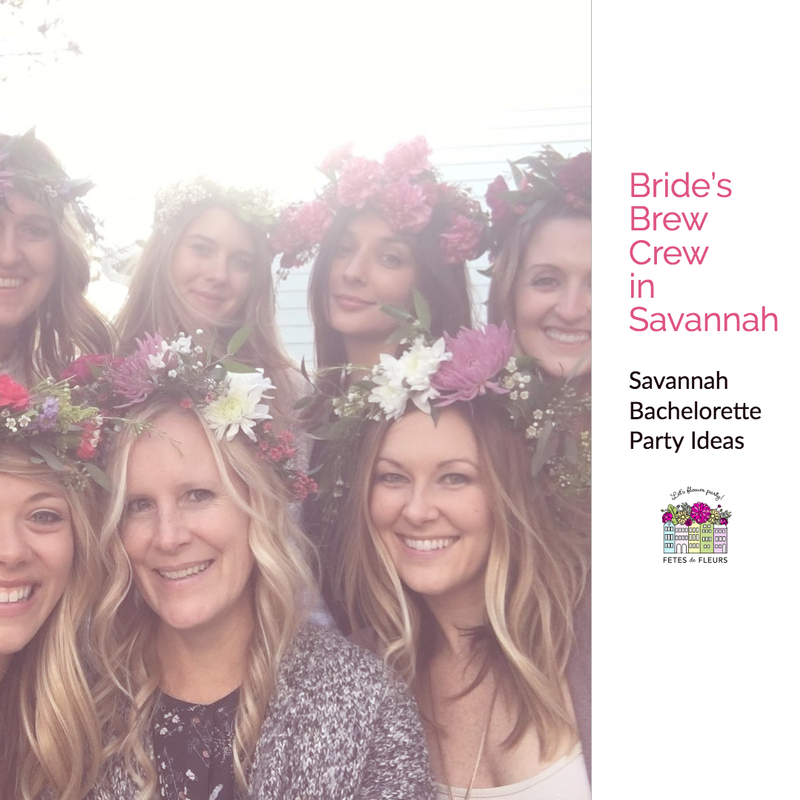 I had the privilege to host a flower crown party for a bride who is having her bachelorette party in Savannah this past weekend. Her friends came from all over Florida and New York and were enjoying our southern Savannah charm. Her story is so fun because her destination wedding is in small town Georgia and she wanted to keep her southern theme going by hosting her bachelorette in Savannah. We were all laughing over the culture shock of being in Savannah after having grown up in New York! Savannah certainly is a world unto herself. They really got to experience the southern charm of Savannah. We hosted a bachelorette party activity with the group on Sunday morning at their airbnb. Our bride had 7 of her friends in Savannah for her bachelorette party weekend. 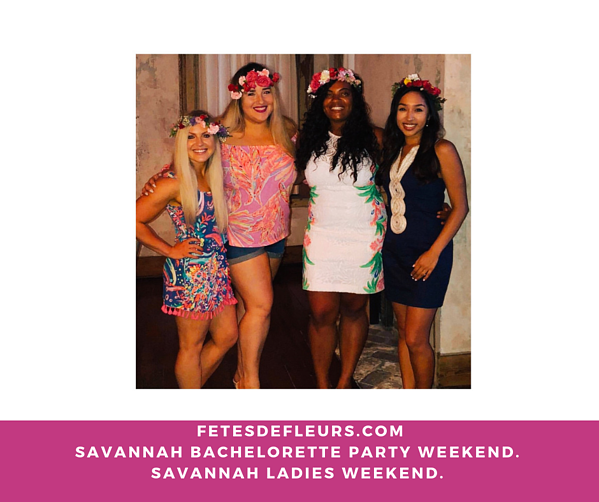 As part of their Savannah bachelorette party weekend they decided to book our flower crown party which we were super thankful and excited to be a part of their weekend in Savannah. Everyone who came are hairdressers which made making the flower crowns super fun for them. They each had their own artistic style and made gorgeous crowns. 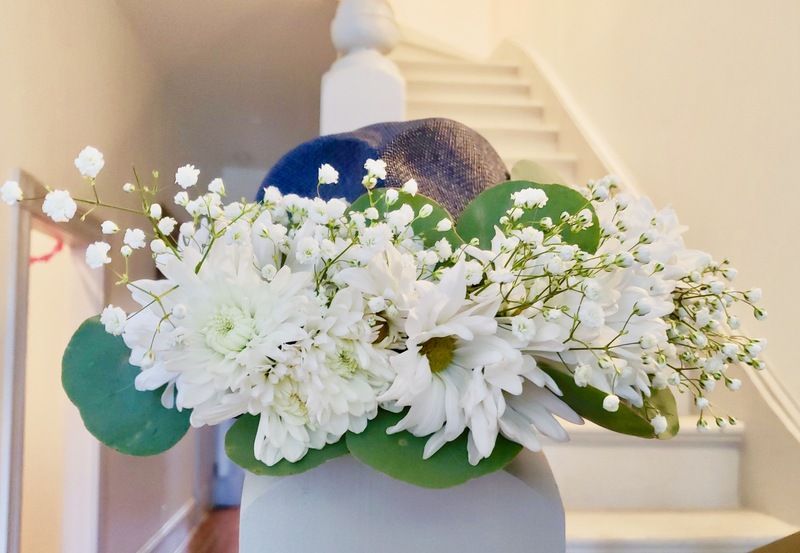 We love that when we host our flower crown parties everyones style and personality ends up coming out in the end design. You will see this if you book a class with us as well. Right after their party, they were headed out for a late Savannah brunch which was really timely because everyone was STARVING after making flower crowns and drinking mimoso’s all morning (a mimoso is a bachelorette party original invented by a lovely New Yorker). Our bride wanted a super lush Snapchat filter-like flower crown. Since she wanted her flowers to stand up vertical like the photo filters, we had to work with the floral tape and the floral wire to make sure that she got the look that she wanted while keeping the flower crown sturdy enough to make through an afternoon of exploring and drinking by the river. We even loaded baby’s breath around the backside so that it was almost like a bridal veil! Bride status all day every day! 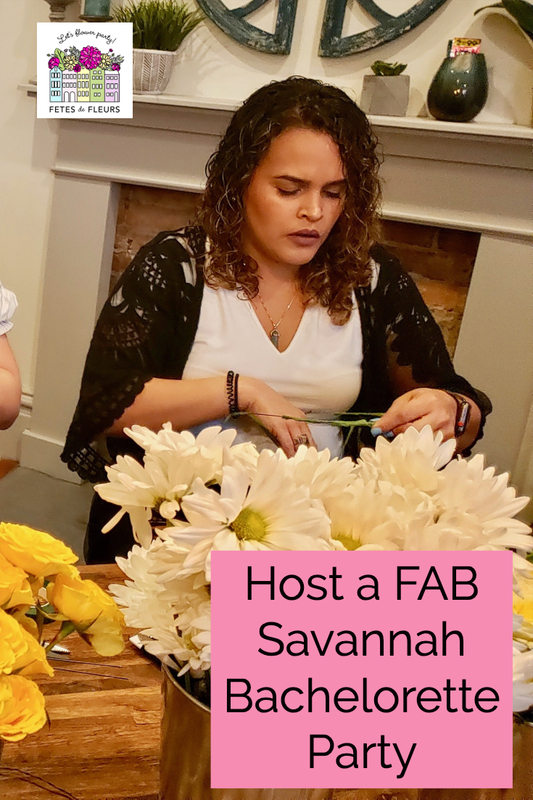 I can’t wait to host the next Savannah bachelorette party and flower crown party with more amazing ladies experiencing all that our lovely southern city has to offer. 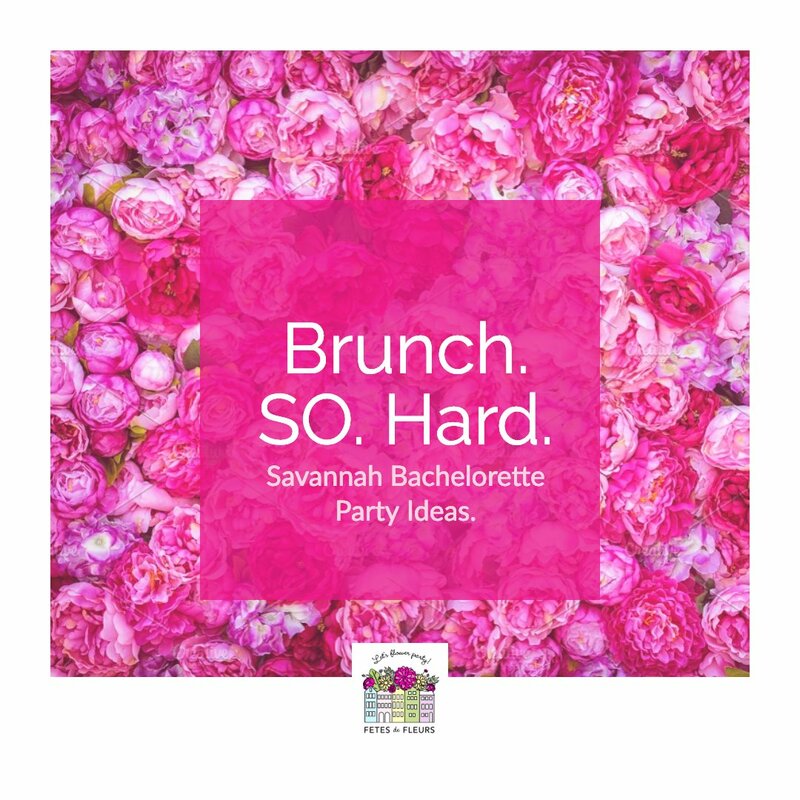 You can request more information about how our Savannah bachelorette parties work here. 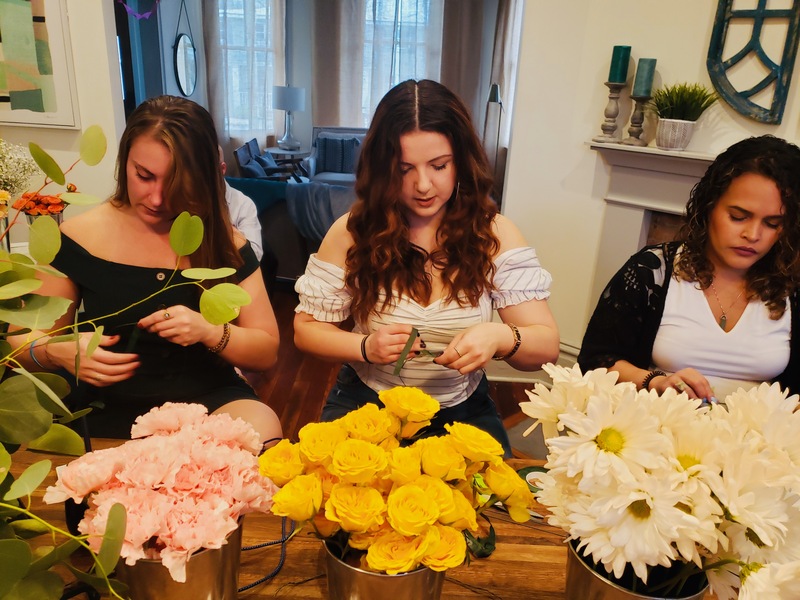 We can't wait to flower party with you all as we head into the busy season for bachelorette parties here in the Spring and Summer seasons ahead! 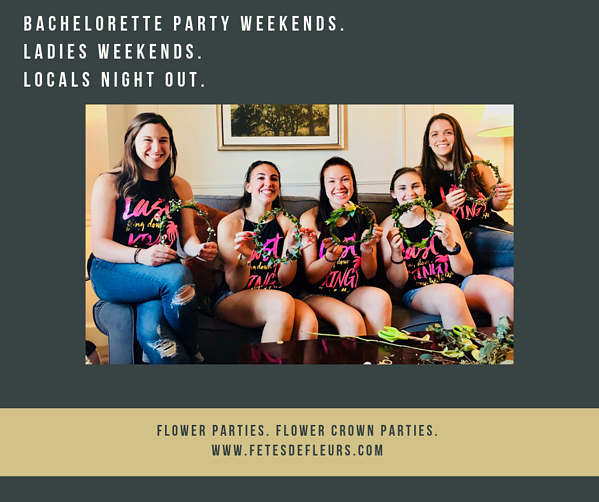 Every bachelorette party group needs to know a few different things for the bachelorette party weekend as they plan what they are going to do while in the city they are going to. One of those things is typically knowing where to get breakfast at the cutest and girliest places for brunch and coffee. 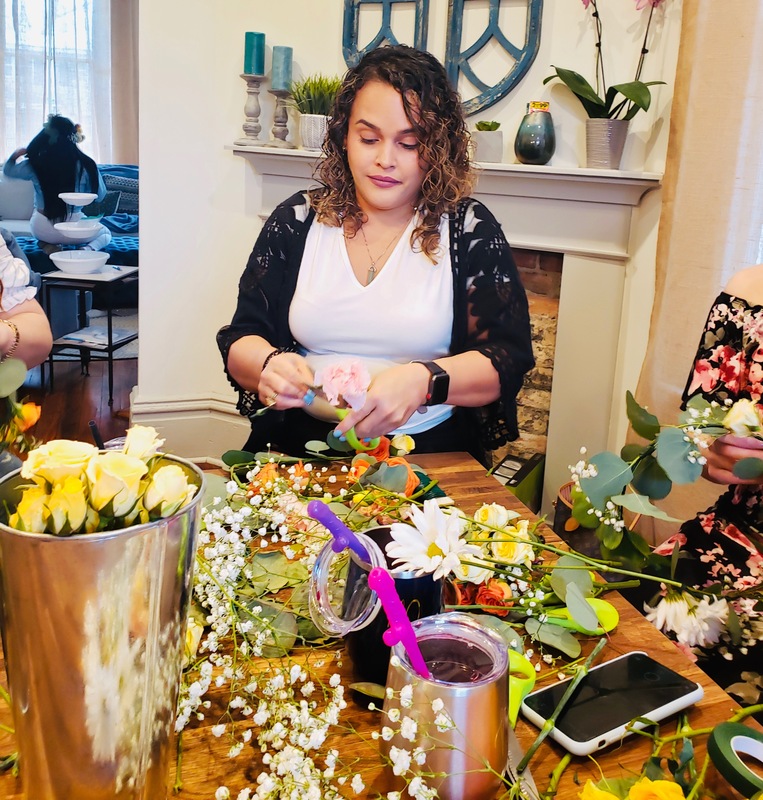 We love doing our flower crown parties over brunch or even breakfast from take out at an airbnb or hotel in Savannah before you get going and exploring for your day ahead. This place looks adorable and was brought to Savannah to bring Australia’s café capitol to Savannah. Styled after Melbourne’s historic Collins Street- this is a cool spot to have brunch and breakfast before bopping around Savannah. 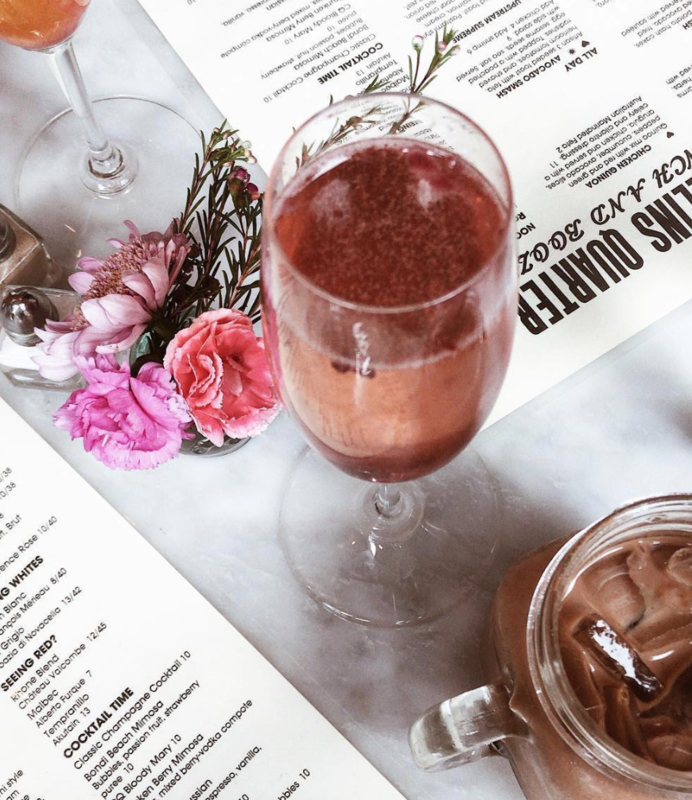 This place looks like they love flowers like we do and they have some really cute brunch breakfast options as well as drinks for you and your ladies. A lot of my friends when I asked them for their favorite brunch and breakfast spots in SAV said this place with a resounding YES, YES, YES - stay for as long as you can because it is the best. 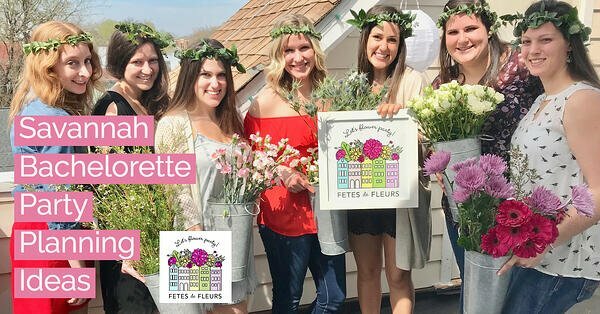 You can follow them on INSTA to be inspired for your Savannah bachelorette or Savannah girls weekend here. If you want to check out their brunch menu you can do that here. Their menu has some gems like breakfast sandwiches if you are a bit hungover :) Or maybe the avocado or pea smash if you are being a bit on the healthier-ish side. They also have some southern faves like biscuit dishes. There is an OG bloody mary too which we all know you will want. 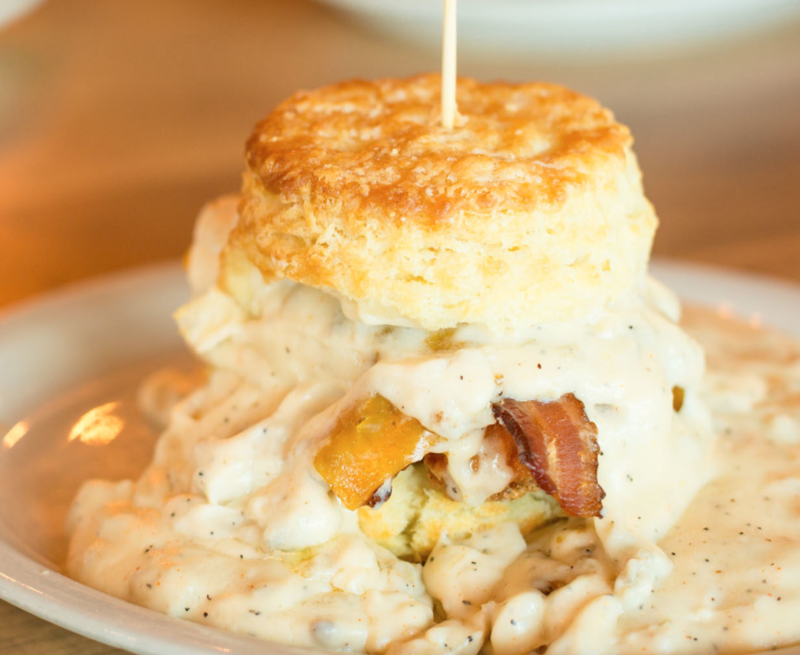 You have had biscuits before but never these kinds of southern biscuits. These biscuits are to die for! If you are heading to Savannah for a bachelorette party weekend you have to make sure that you have southern food while on your trip. Biscuits are a huge part of southern food and culture so you must stop here on your trip to get your biscuit fix. You can check out the different kinds of biscuits that you can get at the Savannah location here. This place is a plant based cafe. We love that! 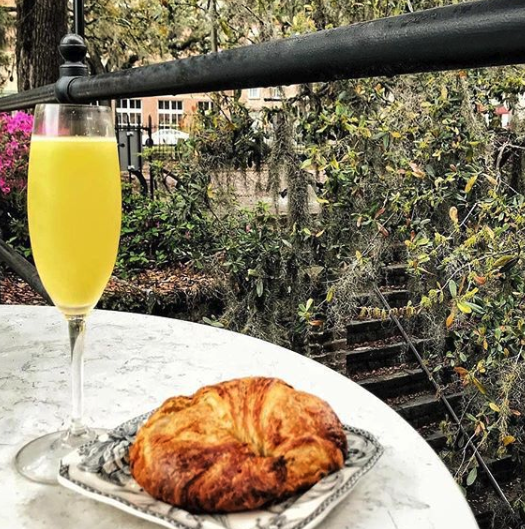 We love the idea of having a healthy breakfast or brunch before hitting the town and walking around to see the beautiful sites that Savannah has to offer. This place is so so so cute. This is Savannah's top vegan cafe featuring locally made coffee selections, Leopold's coconut cream milkshakes, house-made cashew hemp lattes, wine and a brunch-centric menu served all day. Nestled just off Troup Square, Fox & Fig offers a diverse plant-based selection of food and beverage. So if you want a healthy option we highly recommend this if you are trying to steer clear of eating all southern (unhealthy) foods all weekend long. Or maybe you feel like you have overindulged on drinks and just want to start your Saturday or Sunday off on a healthier note you could pop in here. Check out Fox and Fig Instagram here and you can see their menu online here. This is a french cafe so think pastries, macarons, quiches and sandwiches. If you are into a french breakfast or brunch then this might be a good spot for you and your bride tribe. They are a few steps off of the River Street area on Bay Street right in the historic downtown Savannah area. If you are looking for some french food and french decor you can't go wrong having brunch and mimosas here. You can check out their Insta here and their brunch menu here. You have lots of choices of where to eat in general while on your Savannah bachelorette party weekend so even if you don't think ahead or plan ahead just wander around and stop into some restaurants or bars along the way. You will be able to take in some beautiful sites just walking around downtown Savannah and meandering through the parks. If you love flowers (which I am assuming you might) since you are on our site you will love the flowers in Savannah. 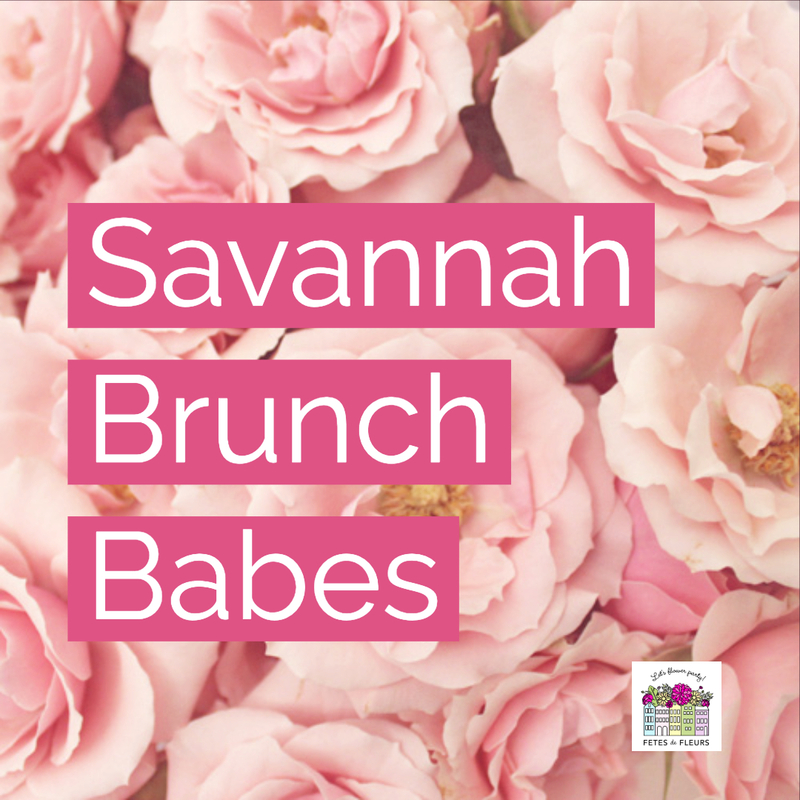 Take your time over brunch and then walk around downtown Savannah through all the parks and streets and you will have lovely time seeing all the southern flowers and greenery. 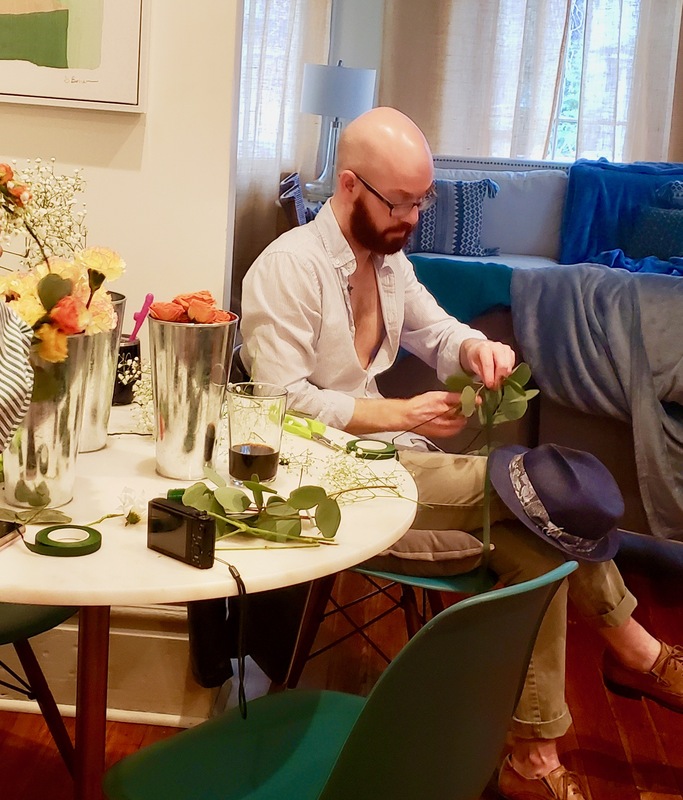 If you are planning on doing a flower crown workshop or getting flower crowns delivered for your bachelorette party in Savannah we can come to your airbnb or hotel after or before brunch to help you make the flower crowns. 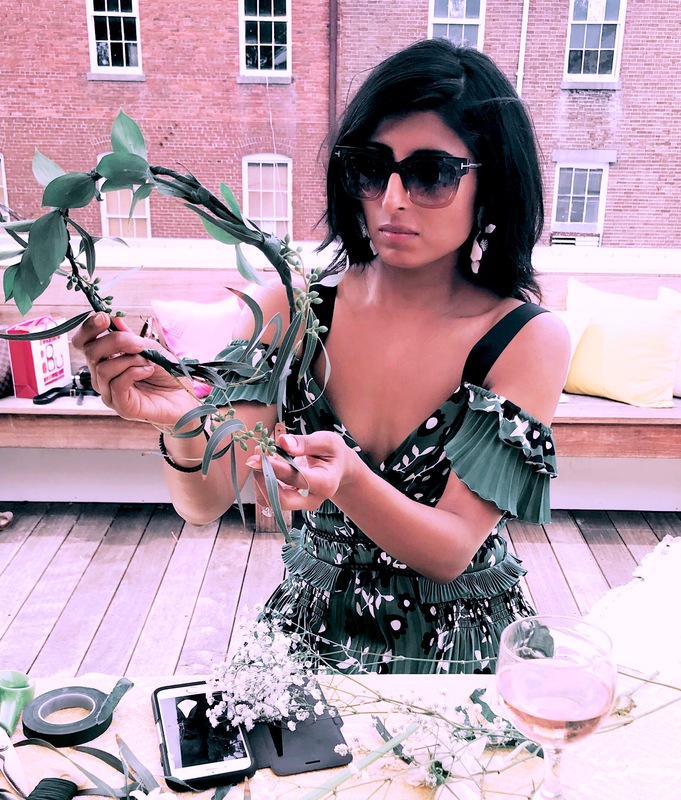 We love when bride tribes do brunch and flower crowns. Perfect way to start a Saturday or Sunday if you are staying for a longer weekend in Savannah. 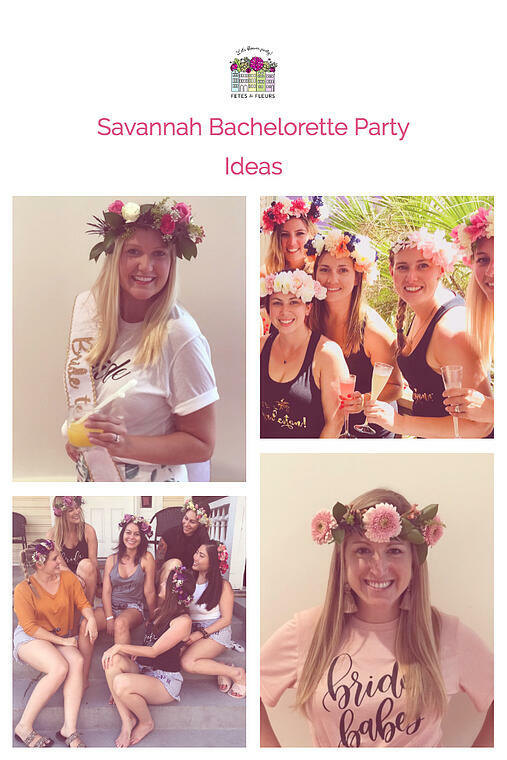 You can request more information about hosting a flower crown workshop or ordering flower crowns for your Savannah bachelorette party weekend here. Hey y’all! Alex again, and I’m super excited to talk to you this week about beer. 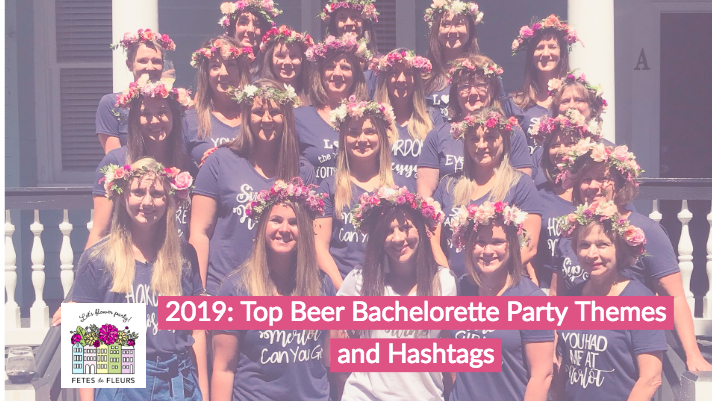 Most of the cities that we celebrate bachelorette parties in have great breweries so if you are looking to do a beer bachelorette party theme make sure you check out breweries while you are planning for your bachelorette party weekend. 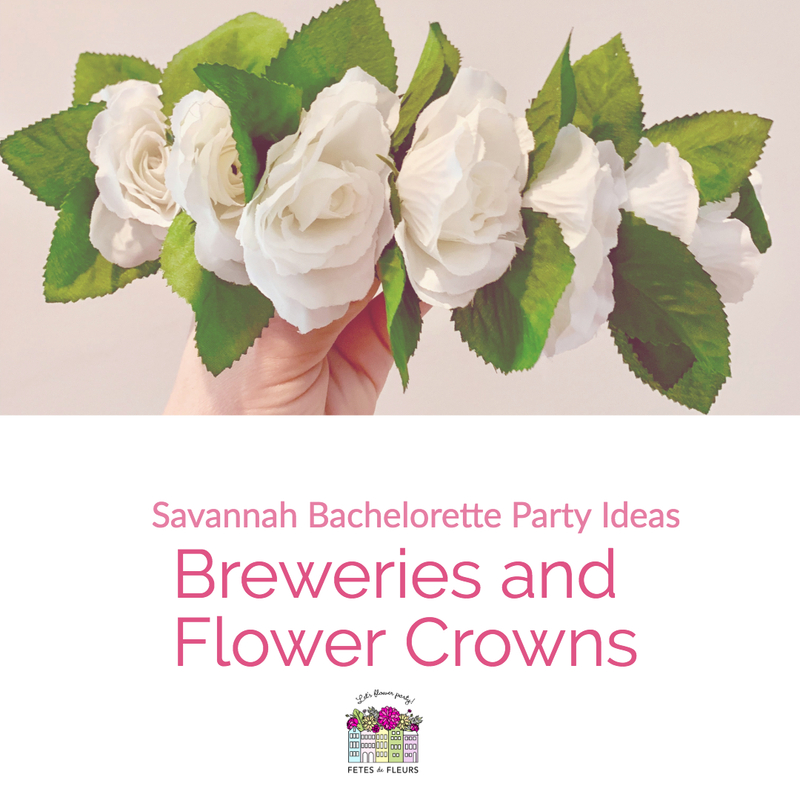 If you plan on doing a flower crown workshop as part of your bachelorette party weekend just let your flower party hostess know that you want to incorporate the flower crowns or flower crown workshop into your brewery tour. We can definitely work with the brewery and do the workshop at a table at the brewery- if that allow that! Which most will! Do what makes your hoppy! 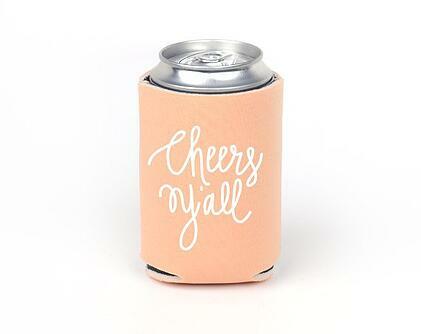 If you go on Etsy and search, “Beer bachelorette shirt” you will get so many cute options that you could tag on to your Savannah bachelorette party as well. 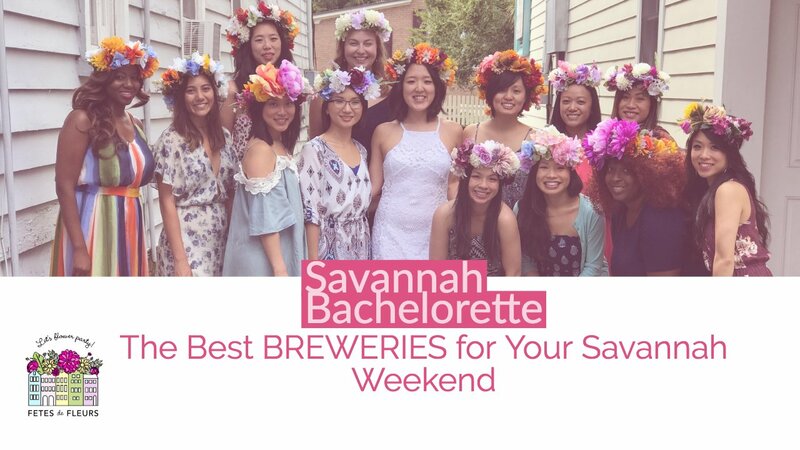 We think a cute beer bachelorette t-shirt with flower crowns will make for the best Savannah bachelorette party. Your first stop on your brewery tap tour should be Moon River Brewing Company. Grab brunch and a nice sour on tap and talk about your next stops as you people watch from the patio and enjoy the historic views. Grab a beer to go and take a stroll down Bay Street after to do a little sightseeing while on your way to World of Beer. They have over 500 beers on tap. It’s insane y’all. Their beers are conveniently listed in an iPad which you can sort by region or flavor profile. I’ve got a World of Beer membership card, so I can keep track of what I’ve tried and whether I liked it or not. My husband tried to use my card and I had to karate chop him so I don’t get my favorite brews confused with his. :) World of Beer does have food, but I’m gonna tell you that the food is heavy and if you’re doing a tap tour, stick with the light food so you will have room for more beer. Speaking of my hubs, he’s a Marine and so we often frequent Service Brewing. They are veteran owned and operated and we really like to support vets in our community. Service hosts Beer + Yoga with Karrie Comeau on the last Saturday morning of every month. It will kick your behind. Thankfully you get a nice cold beer after so it makes it all okay! And there’s usually a food truck standing by to replenish the calories you just burned with that good workout, ladies. They also have CATS. It’s like a bachelorette party dream - yoga, beer, cats. Why would you even consider anywhere else for a Saturday morning on your Savannah bachelorette party weekend? Two Tides is a trendy brewery tucked away in the Starland District of Savannah. Most of their beers are small batch so make sure to check out their Facebook page to see what’s currently rotating. Two Tides prides themselves on being approachable so if you have some girlfriends that aren’t normally beer drinkers, this would be a good stop to get them some easy drinkers. Southbound Brewing is a Savannah staple. They are fairly well known, and you can catch them in many local bars and restaurants on tap too. So make sure you look for them around town as you bar hop around Savannah! Making your way over to the brewery will bring you to super fun events like BBQ’s, Trivia Night, Pints + Poses (yoga! ), sushi making classes, live music, and comedy nights. 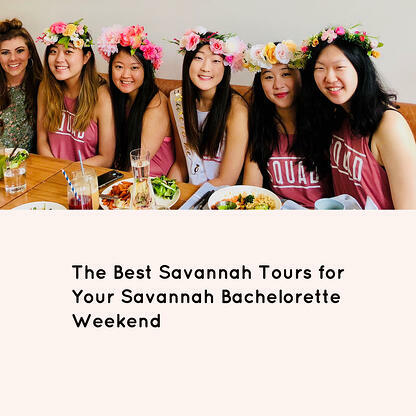 There’s something happening pretty much every weekend, so this is really a no brainer for adding them into your Savannah bachelorette itinerary. Southbound has really solid year round favorites and their rotating craft beers will delight your palate. I really hope to see you sometime soon at the bar of one of these amazing breweries. Try ordering a flight so that you can taste several beers at once and find your favorite. We definitely think that flower crowns and brews go well together. 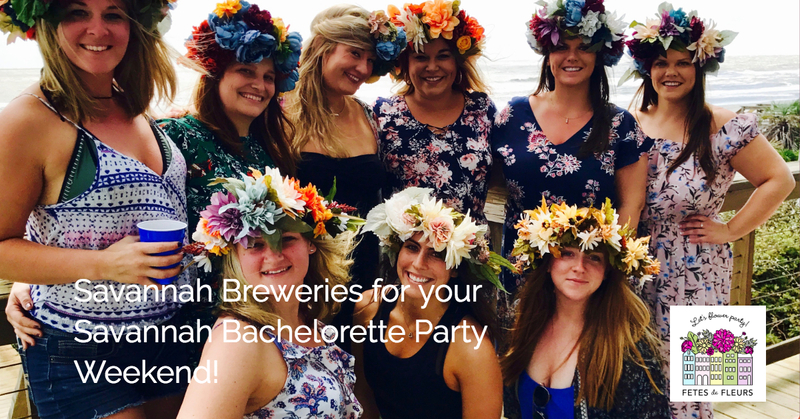 Plan a flower crown workshop with us at a brewery or wear your flower crowns out on a brewery tour as well! 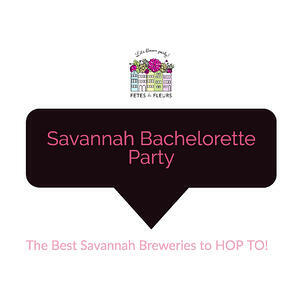 We can't wait to flower party with you over some beers for your Savannah bachelorette weekend. One of my favorite tours is the Bonaventure Cemetery Tour. It’s one of the most gorgeous cemeteries ever. It was the muse for John Berendt’s “Midnight In The Garden of Good and Evil”. The cemetery is huge – measuring over 100 acres. Due to the large acreage, it can be overwhelming to explore on your own so having a knowledgeable tour guide is a must. The tours are reasonably priced, relaxed, and will introduce to you to a Savannah that you didn’t know existed. Highly recommend this one if you like anything spooky or ghost like! We think yes, yes! In my 20s I was the Dallas, TX queen of pub crawls. My local watering hole hosted a crawl during winter break every year and my holiday season didn’t start until we went on the crawl. When I moved to Savannah, the first thing I did was find a pub crawl to top my previous holiday shenanigans. Enter the Savannah Slow Ride and their 15 bike Crawler. Eco-friendly and calorie burning, these pub crawls are amazing. They take you to historic cars and get this – downtown Savannah has an open container law, so YOU CAN TAKE A TO GO CUP WITH YOU. Come on?!?! This is the life! 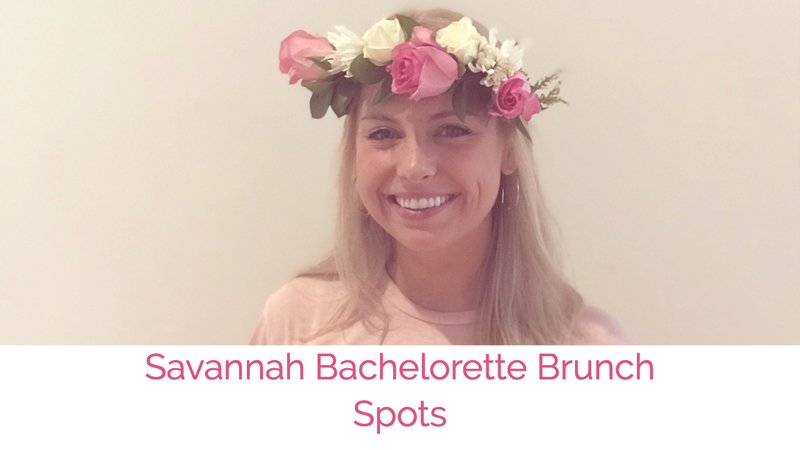 Savannah Slow Ride loves to theme so a brunch time flower crown party and then a flower bike pub crawl sounds like the perfect Savannah bachelorette party or girl’s day out. Training to be a pilot by any chance? Amphibian Air will have you flying like a bird over Savannah and even possibly taking control of the aircraft yourself if the weather is good. The tour will end with a certificate recording your training that can be used towards a sport pilot license. I don’t know about you, but I look amazing with flowers in my windswept hair so this is a top southern to do item for me. Of course a Savannah weekend would not be complete without a ghost tour of Savannah. Some of the best ones are from Ghost City Tours. They’re located in several cities so they really know what they’re doing when it comes to researching the most haunted places in your city. The ghost tours don’t have to be scary, but if spooky is what you’re going for, then The Beyond Good & Evil Tour might be just up your alley. This tour focuses on the macabre side of Savannah and will give you a unique 360 tour of the spooky side of Savannah. The Graves Tales Tour is focused more on the historic stories of what makes the city haunted. I like that it’s suitable for all ages so if your bridal or bachelorette party has young ladies in it, they can join you on this excursion. I really think that you could find a tour for anything that you might be searching for while in Savannah. 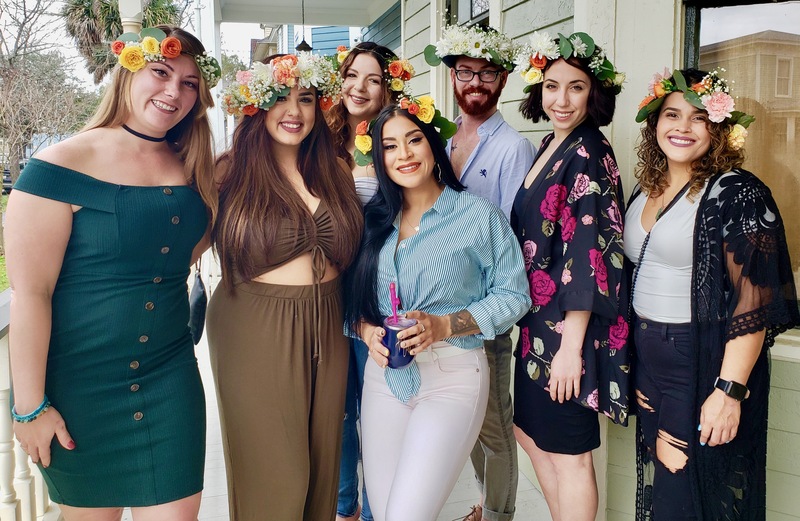 Don’t forget to book your flower crown party beforehand so that you can be decked out in blooms for your excursions and tours around our beautiful city of ours. 1. You love southern charm. 2. You want to eat good food. 3. You want to be able to drink cocktails in the streets. Yes, you read that correctly. You can drink while you walk around Savannah. 4. You love flowers!!! There are beautiful gardens, and flowers in Savannah. 5. You want to stay at a chic hotel or airbnb with once again, southern charm! 6. You want to be close by to beaches and have good weather. 7. You love a good roof deck with Frose. 8. You want to be in a city with lots to do but that is manageable to walk around in. 9. Top restaurants and bar scene in the US. 10. You want to have options for tours, cultural things to do, etc on your bachelorette party weekend. 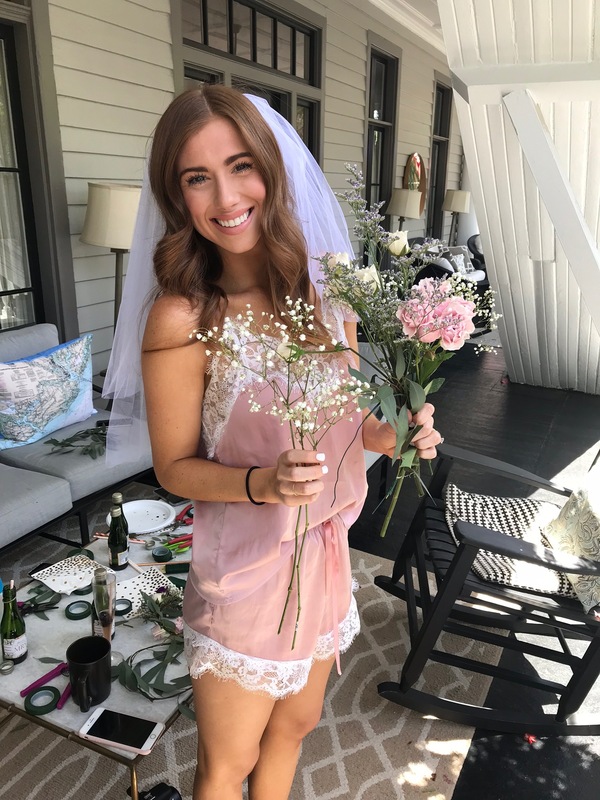 If you have picked to have your bachelorette party in Savannah you probably are now deciding on what bachelorette party favors and bachelorette party gifts you should have for your bride tribe crew. If you are heading to Savannah you can definitely do a theme that is in line with the Georgia Peach. 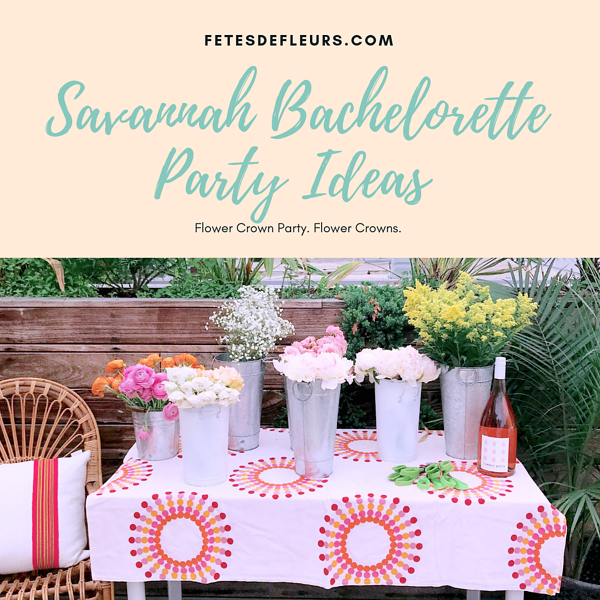 Here are some cute bachelorette slogans that you could revolve your Savannah bachelorette theme around if you are going in the PEACHY direction. She is Prettier than a PEACH! 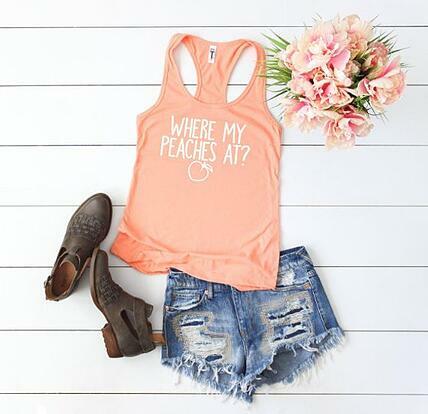 We love the Peach theme for a bachelorette party weekend because it is just so cute. Add in Savannah to the mix and you have yourself a great theme for your weekend. 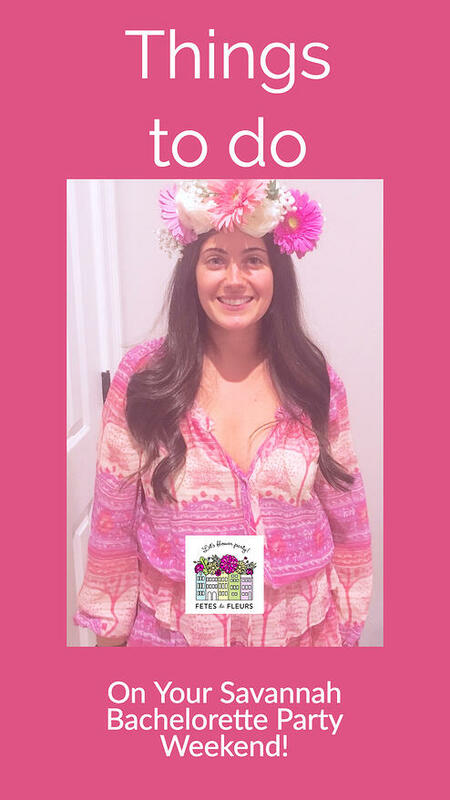 Throw in peach colored flower crowns with us as well and wear your peach bachelorette party shirts with those flower crowns around town. 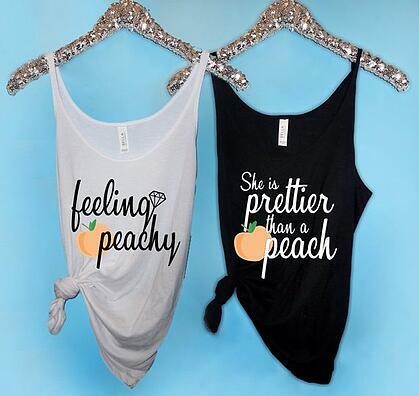 And if a bachelorette party t-shirt with a slogan is not your PEACH then you can do a peach colored bridesmaid t-shirt instead that isn't so in your face with a theme slogan. If you haven't found this out already ladies, you are allowed to drink wine, cocktails, frozen drinks, etc on the streets of Savannah. Yes, we know! How cool is that!??! You are in for a real rocking time in Savannah for your bachelorette party weekend ladies. There are these super cute tote bags that you can have made on this etsy shop here. 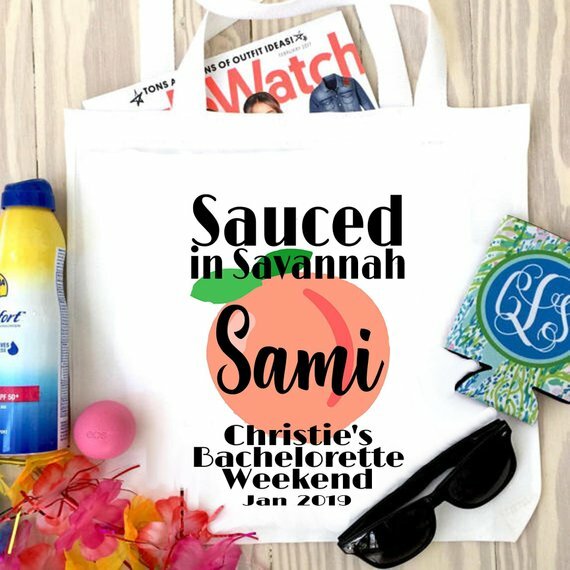 I would also get t-shirts made or even towels made that match this "sauced in Savannah" bachelorette party theme. These would be great for a day trip out to the beach at Tybee Island. 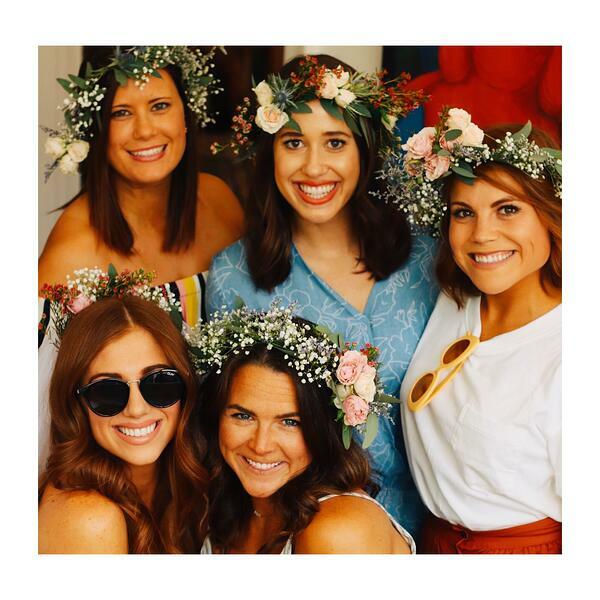 Pop your flower crowns into the beach bag and some rose- head out to Tybee Island or another beach off the coast of Savannah and get sauced in your flower crowns that you made before your beach trip ladies! 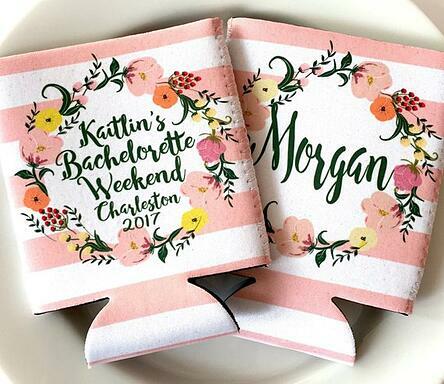 We just adore these cute Koozies with the flower wreath around them! They are such a perfect match for our flower crown parties in Savannah. 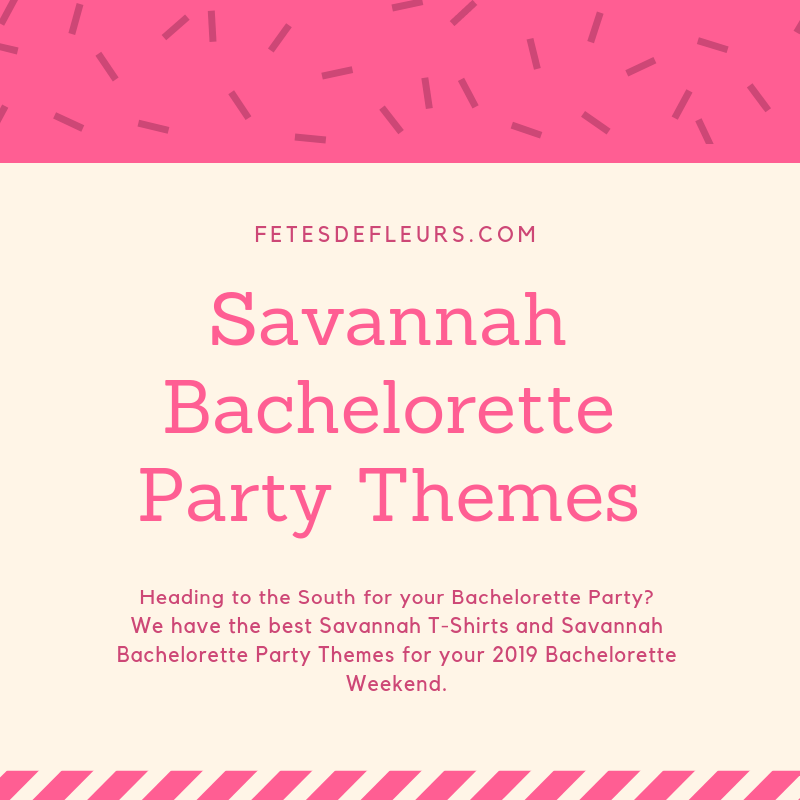 We hope these bachelorette party themes and bachelorette party t-shirts/koozies were helpful as you plan your Savannah bachelorette party weekend. 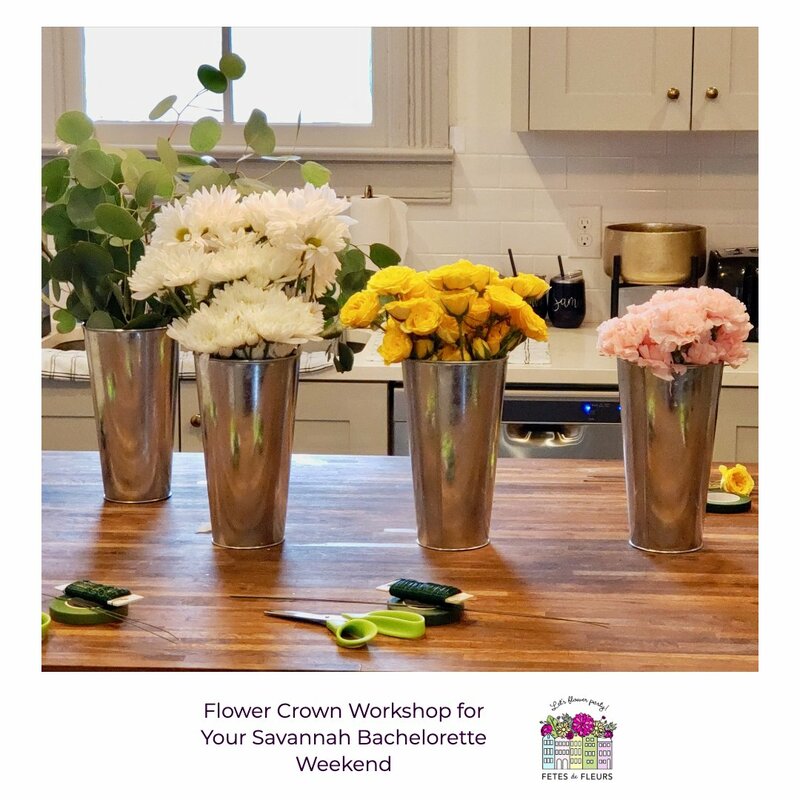 We hope you will consider a flower crown workshop as part of your Savannah ladies weekend or if you don't want to make the flower crowns we can always make them for you and drop them off at your hotel or airbnb so you can just pop them on your head and wear out and about Savannah. Either way, we hope you have the best time in Savannah! 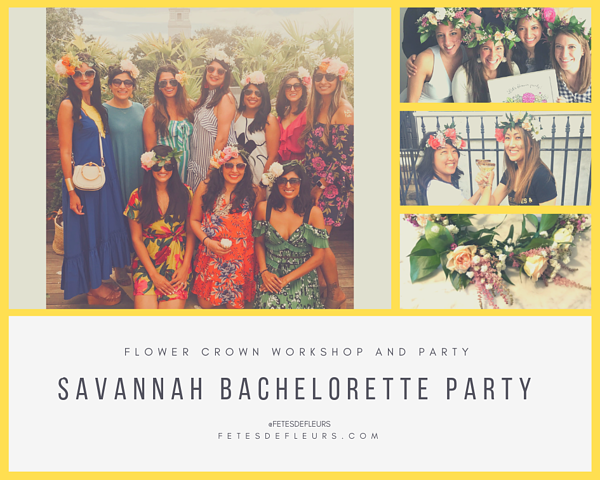 If you are interested in learning more about our flower crown parties in Savannah you can fill out the form here for more information! The hotels are just as amazing as the Historic Squares scattered throughout the city. Many of the hotels offer spas, room service, full bars poolside, 5 star restaurants, and easy access to shopping, bars, and all of our city attractions. 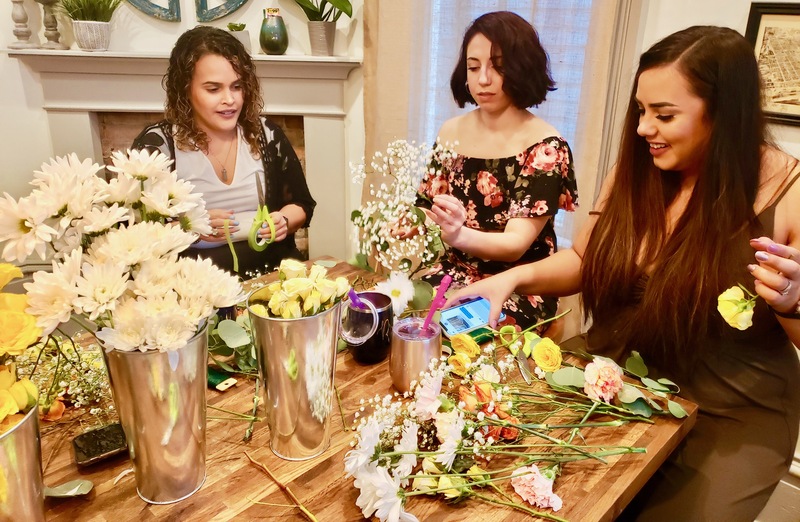 If you are looking for a more intimate girls getaway that is a little quieter and little more historic, the B&Bs available are exactly up your alley. We also have a lot of great airbnbs that you can check out too if that is more your style. Either way you, even if you don't stay in these hotels you should check them out or stop by to take in the beauty of their spaces, restaurants, rooftops and bars. One of my absolute favorite hotels is the Alida Hotel. The hotel is located in the riverfront district of Savannah. This hotel is definitely a hidden gem. The rooms are sumptuous, huge, and offer suites or if you have a big group. You can also reserve a penthouse for your girls weekend. The pool is gorgeous with cabanas, a full bar, AND fire pits in case of cool nights. One of my favorite things to do when visiting a new city is to find the hidden locals only spots. Locals always know the best spots to visit. Check out the Alida Hotel's Instagram here to see some beautiful photos. Their photos will definitely get you in the mood to start planning your stay in Savannah. Mata Hari is a fun speakeasy lounge that requires a password to enter. The Alida concierge can help you get the password so you can rub elbows with locals in the know. 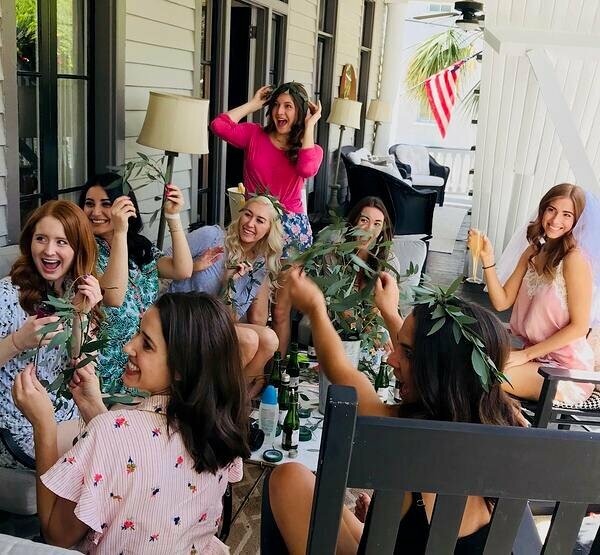 I have hosted a girls weekend at the Mansion on Forsythe Park and it was decadent. I can’t even describe the level of pampering that went on at this lovely place. There is a curated art gallery featuring local artists, a spa that resembles an underwater oasis, restaurants, bars, in room spa services, group spa services, spa services for days! I am obsessed with my spa days if you couldn’t tell. Also, I love having activities scheduled when hosting girls weekends and the Mansion offers cooking classes on site. How fun is that? A little food and a little wine and we were one happy bunch of ladies! To top it off, there is live music from local artists and having a cocktail while listening to live jazz is my jam. The suites are amazing and spacious. I can’t get enough of this hotel. Sometimes I need to be ballin’ on a budget and the Homewood Suites Riverfront by Hilton fits me perfectly. The hotel is located on River Street and comes with the Hilton guarantee. I love Hiltons and am a member of their rewards program which makes picking a hotel really easy for me when I travel. The Homewood in Savannah is located in the historic riverfront district and many of the suites have a river view. There is complimentary breakfast in the morning so you can sip coffee and enjoy the view of the river from your suite. One of my favorite features of Homewood Suites is the free cocktail hour Monday to Thursday from 5:30-6:30 which offers complimentary wine and beer and small bites. Hello, I may never leave! The hotel offers a rooftop pool with heaters to warm you on chilly nights, charging stations for your phones, tvs, and a light bar menu. It’s perfect. During the day, you are walking distance to shopping, restaurants and breweries. Or take in a carriage ride or walking tour of the city. The history never disappoints. 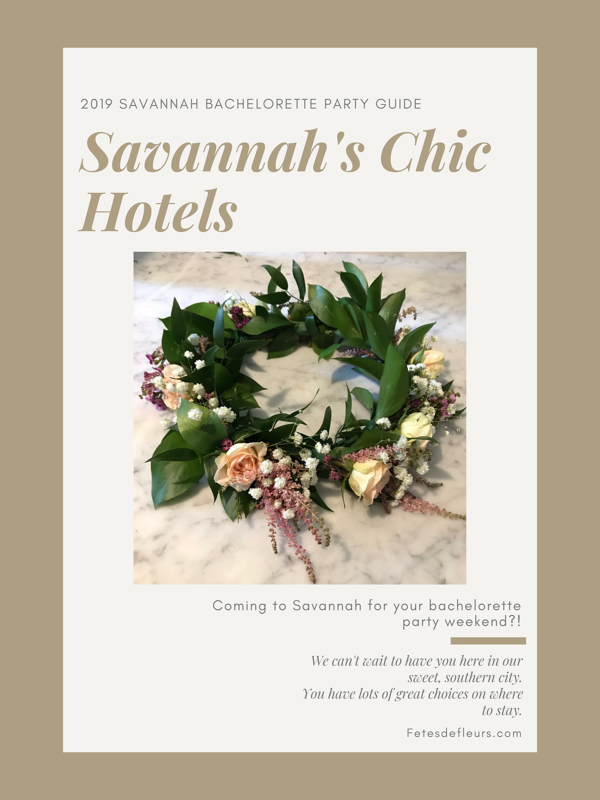 We hope this helped you think through some of your options for your Savannah ladies weekend or a Savannah bachelorette party weekend. 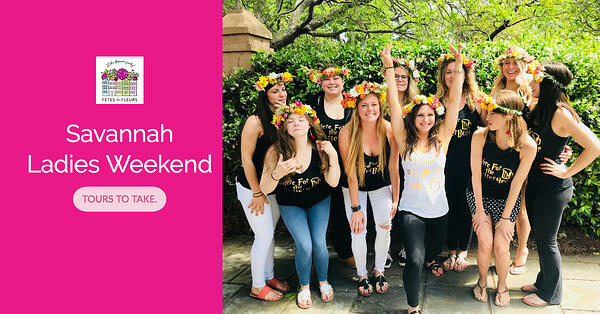 We hope you will consider doing a flower crown party as part of your Savannah Weekend plans. 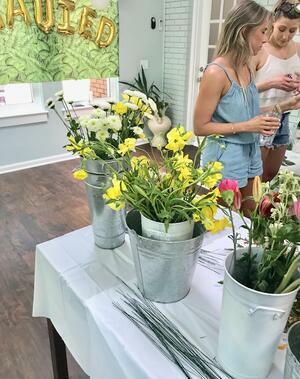 You can request more information on a flower party in Savannah here. Hey Babes! This is Kaitlynn, one of your flower party hosts here in the Savannah area for your ladies weekends and bachelorette parties. 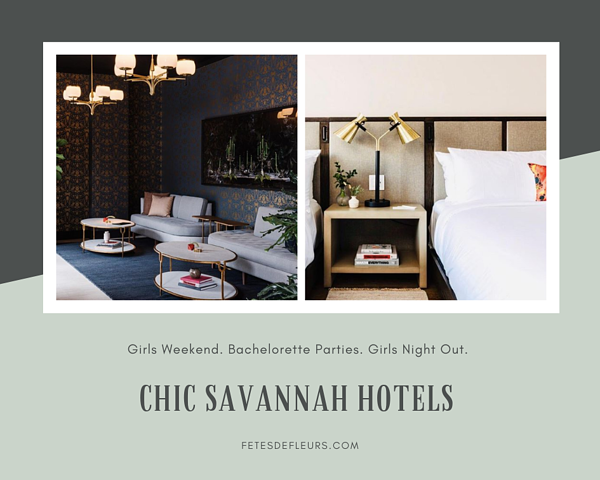 You can always check out our Savannah Guide for all your bachelorette planning and girls weekend planning here. So let's get down to business with our top 5 picks for a Savannah Weekend with your Bride Tribe or a Girls Weekend in Savannah. Obviously, this is a must do! 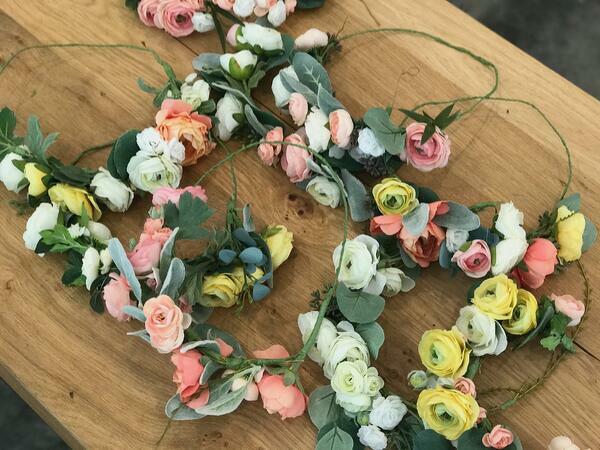 Come pop the bubbly and make all your flower crown dreams come true with us in this girly activity. This is 2 hours you wont regret during your weekend with your besties having fun, learning new skills with flowers and drinking all the rose! 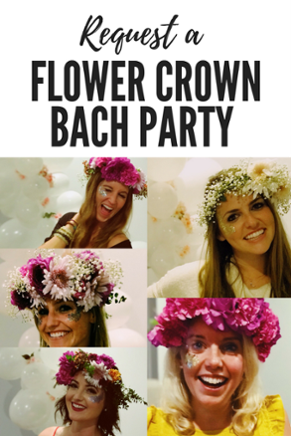 You can request information on how our flower crown parties work right here. 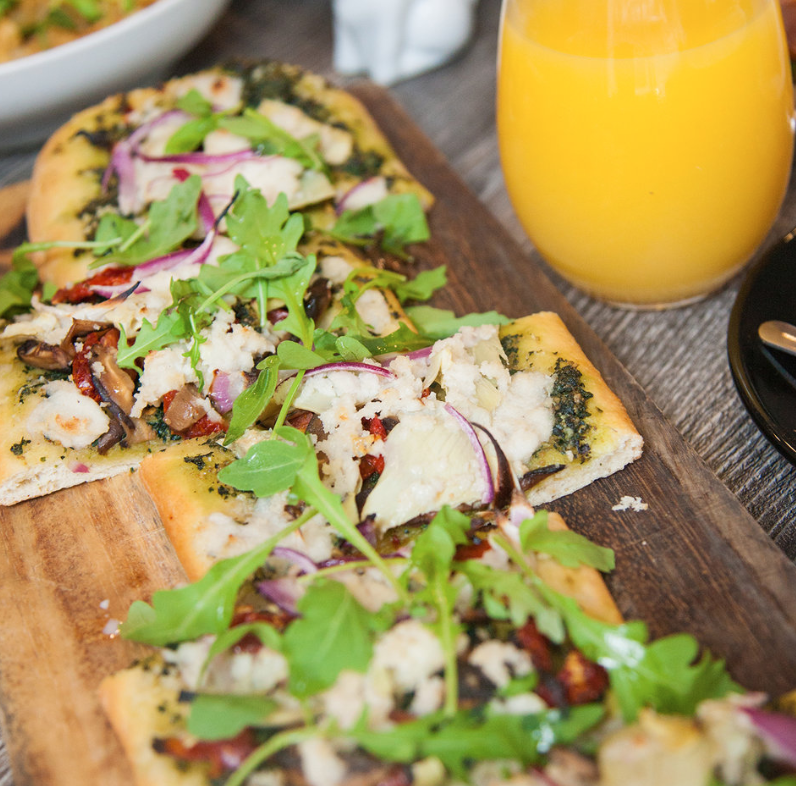 Brunch, brunch, and more BRUNCH! There are sooo many amazing brunch places in downtown Savannah. Whether it’s The Ordinary Pub, Little Duck Diner, B. Matthews, or any of the amazing others...food is a part of our great, charming city. You don’t want to skip out on brunch while here on your weekend in Savannah. So take some time to think about where you want to brunch and plan out some fun brunches for our girls. If you want to keep the party going after your done enjoying your French toast don’t hesitate. Savannah has no open container laws. YES, Girl, you read that correctly. Grab that plastic cup (stationed conveniently by the exit) and hit the door. You can really drink anywhere in Savannah. So have a great time wandering the streets and taking in all the beauty while drinking some rose and wearing your flower crowns. You will find lovely places to take pictures in your flower crowns post brunch. 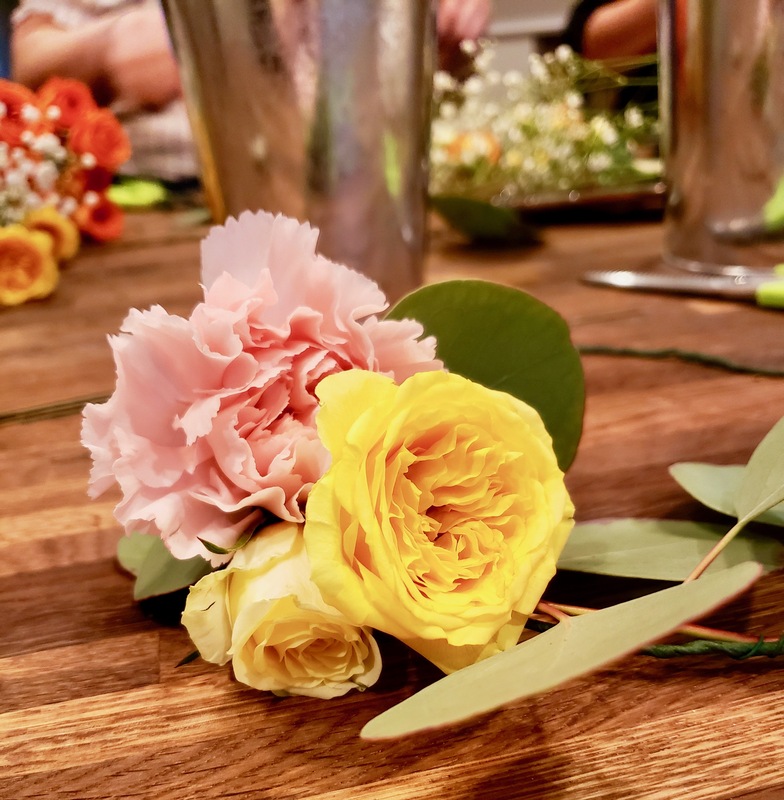 We can even meet you at a restaurant (if they are cool with it) and setup a flower crown workshop for your group to do over brunch. This is a great way to see the city, try out the bars, and take in the scenery. The slow ride is a 15-person pedal bike. You can schedule a variety tours, so that you can see whatever part of the city interests you the most, and with no open container laws, you can literally sip your cocktail on the go. 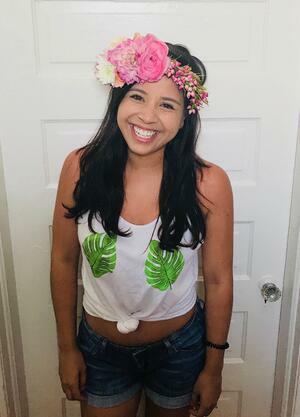 Just don’t try to drink and pedal too fast ; ) We definitely think wearing your flower crowns while pedaling is so cute. Make sure you send us your photos of you pedaling with those flower crowns on. You can’t go wrong with a spa day downtown. Spa Bleu, located right in the heart of the city, got voted the best day spa in Savannah. From the décor to the organic products, the minute you walk in you’ll be feeling relaxed. Milan Day Spa is another great spa that will relax you from the minute you hit the door. They have everything from hair services to full body massages and everything in between. We love a spa and flower crown combo. We are happy to work with your spa to come up with a way to do flower crowns after your spa treatments too. Broughton street is sure have everything you want! From major name brands to the cutest mom and pops shops, Broughton St. is a great mix of all kinds of shops. You can stop for lunch, unwind at one of the spas, get a makeover, or shop until you drop all in one place. Whether you’re only here for a quick overnight trip or a few days, we hope this narrows down your “must-do” list.